The bond bear market actually started just over four months ago, after 10-yr Treasury yields closed at an all-time low of 1.36% on July 8th, a crisis of sorts that was prompted by fears that "Brexit" represented a serious threat to global growth. Today the 10-yr is trading at 2.22%, almost a full percentage point higher. 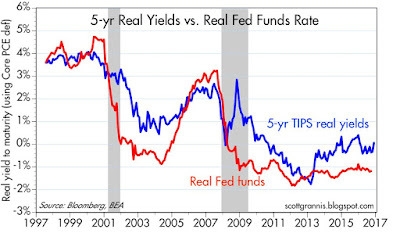 Over that same period, the real yield on 5-yr TIPS has jumped from a low of -0.5% to -0.06%. 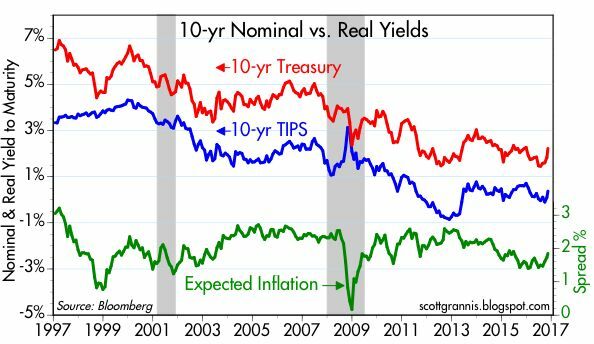 Nominal yields have risen more than real yields, which tells us that the market has all but abandoned its fears of deflation. 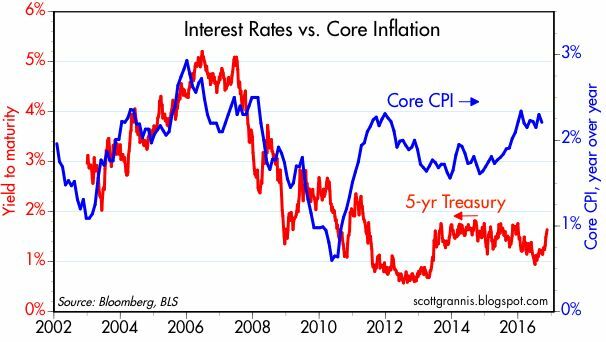 Long-term inflation expectations are now a very reasonable 1.8%, up from a low of 1.4% last June. 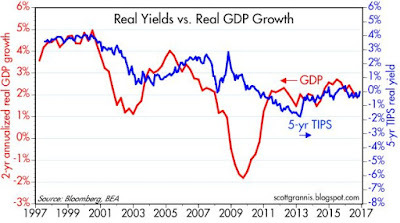 Higher real yields tell us that the market now believes growth will be stronger going forward. Meanwhile, the dollar has risen to the top of its 2-yr trading range, and that tells us that the U.S. economy is likely to be the most attractive of the developed economies in the years ahead. 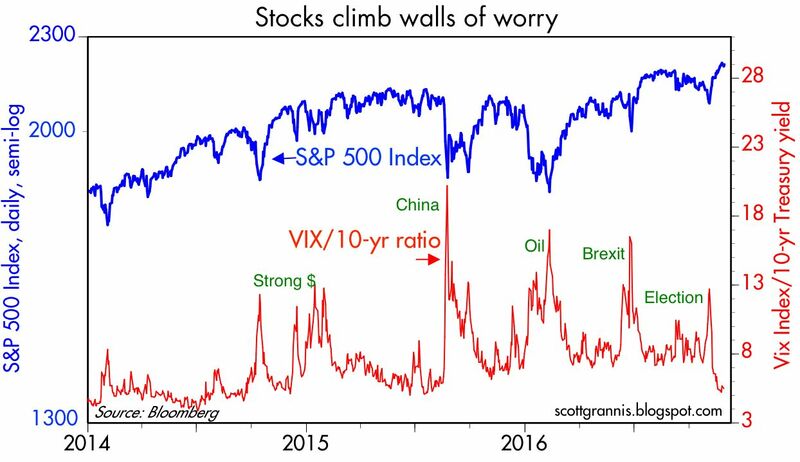 This is all very encouraging, but we're still in the early stages of what is likely to be a huge bond bear market. Why? 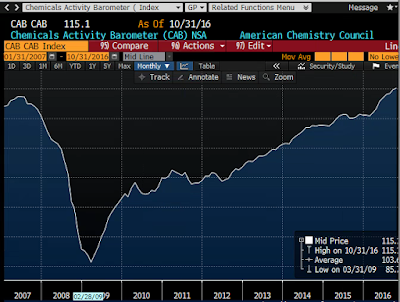 Because confidence is on the rise and the demand for money and safe assets is beginning to decline, and that means the Fed is going to have to raise rates by more than the market currently expects if it wants to keep inflation expectations in check. 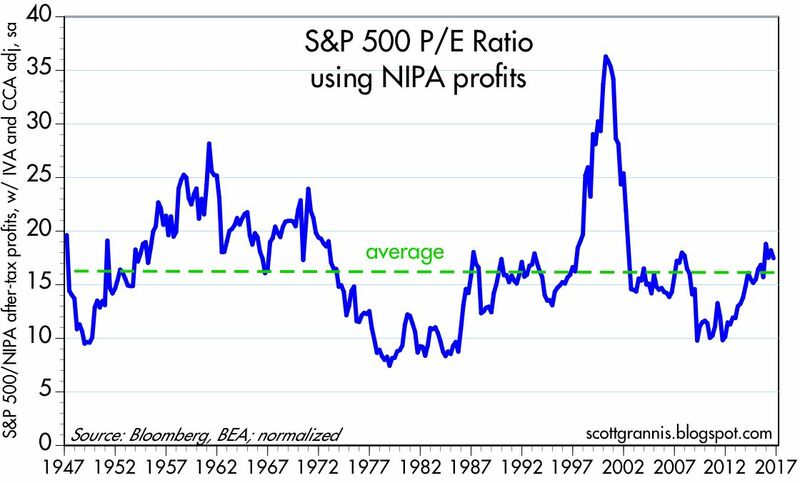 Perma-bears worry that Fed tightening and higher interest rates will surely abort any nascent economic boom, tipping us instead into another recession. 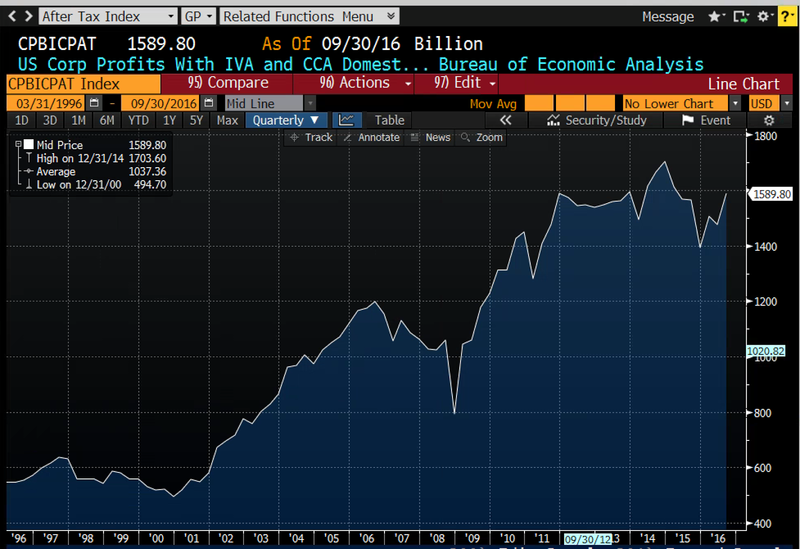 They see the bond market flashing a warning: Trump wants to spend too much, and the bond market vigilantes are saying that's a bad idea. Put another way: if you thought the stock market rally of the past seven years was all a function of easy money, then today you're terrified that tighter money will be the death knell for the stock market. 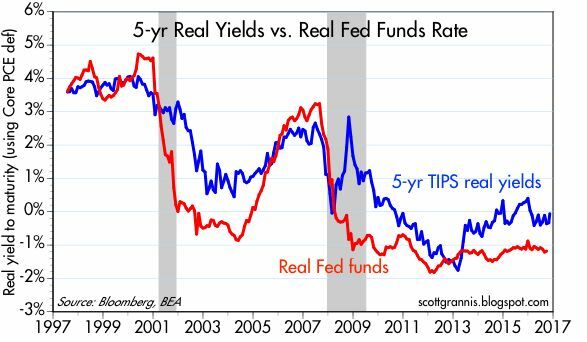 In contrast, I've been arguing for years that higher interest rates won't be a problem, since they would be symptomatic of stronger growth. 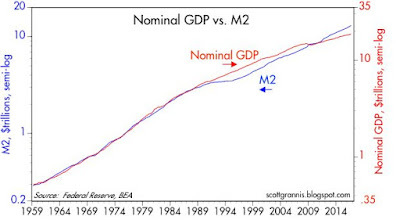 Higher rates won't lead to an exploding deficit, because the stronger growth that pushes interest rates higher will also work to reduce the deficit by boosting tax revenues. Interest rates have been low because the market has had a very pessimistic view of the future growth potential of the U.S. economy. 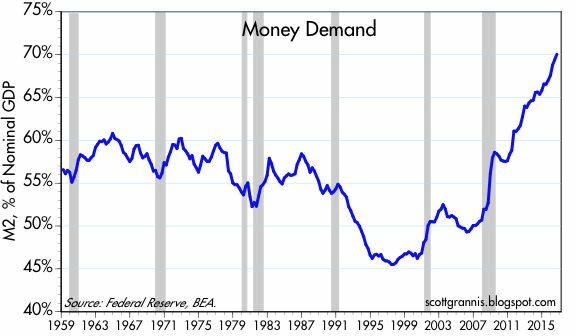 The Fed has been easy not to stimulate the economy, but to offset a risk averse market's huge demand for money. 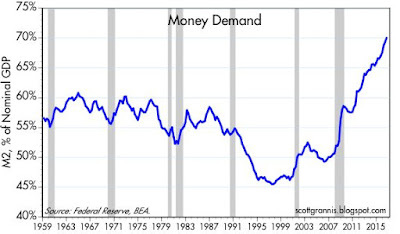 Monetary tightening won't be as painful this time around, because the Fed won't be draining reserves as it has in past cycles, it will simply declare that it will pay a higher rate on bank reserves, which will be necessary to offset the market's declining demand for money. 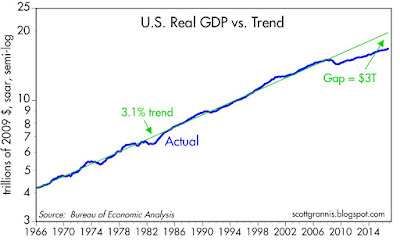 By the same logic, Trump's tax cuts won't explode the federal deficit (which is currently a non-threatening 3% of GDP) since they will help boost growth and generate higher revenues. 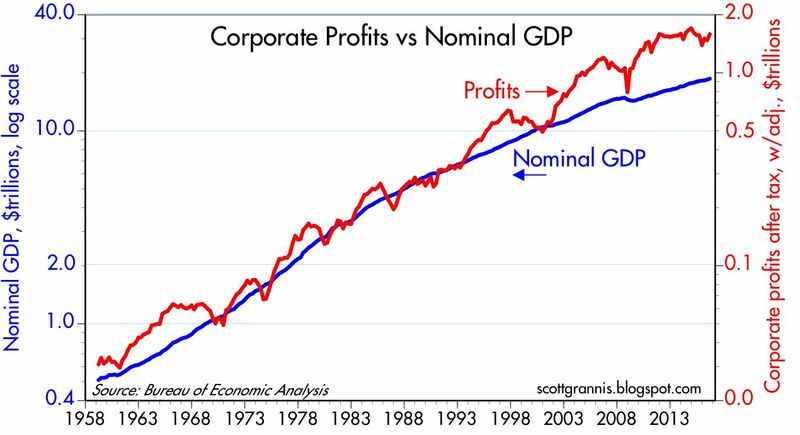 Consider: today's 35% corporate tax rate has failed miserably to generate revenues because corporations have refused to repatriate as much as $3 trillion in offshore profits. As a result, the government has collected 35% of nothing. 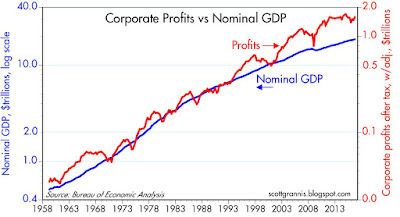 Trump's plan to charge corporations only 10% on their offshore profits could generate revenues of as much as $300 billion (i.e., 10% of $3 trillion) if corporations decide that 10% is a reasonable tax to pay on overseas profits. 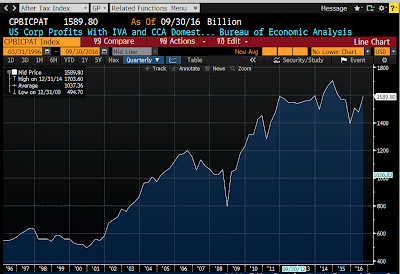 As Art Laffer always says, if you tax something less, you can expect to get more of it. Bond yields are rising because the market is becoming less concerned about slow growth and more confident that growth will pick up. Happily, the same thing is happening in Japan and in the Eurozone. 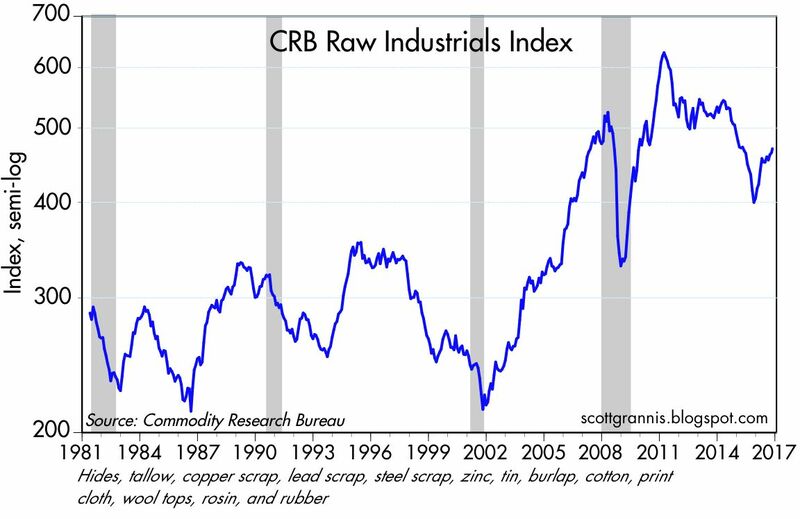 Moreover, industrial commodity prices are up over 20% in the past year because global growth fundamentals are improving. Hooray! 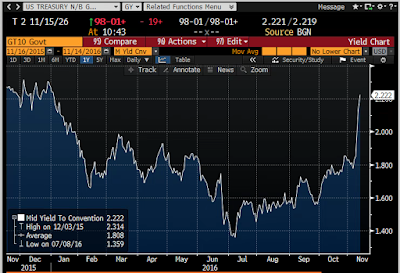 The chart above shows the explosive rise in 10-yr Treasury yields in the past week and since their all-time closing low last July. 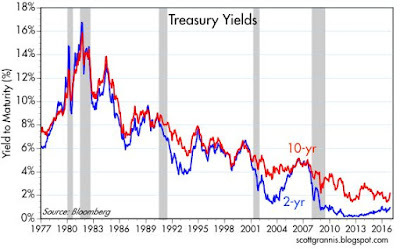 10-yr yields are up over 40 bps since last Monday, but 2-yr Treasury yields are up only about 20 bps. 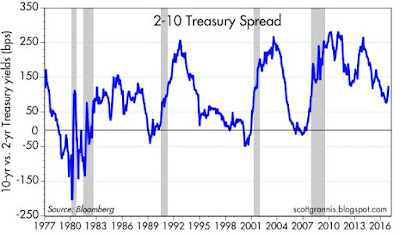 This represents a modest steepening of the yield curve which is fully consistent with an economy that is expanding. As the second chart reminds us, yields are still extremely low from an historical perspective. 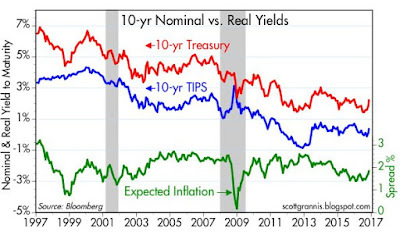 10-yr nominal yields have risen by more than their real yield counterparts, which means that inflation expectations have increased. The bond market now expects consumer price inflation to average about 1.9% over the next 10 years, which is almost exactly what it's been over the previous 10 years. Nothing wrong with that! 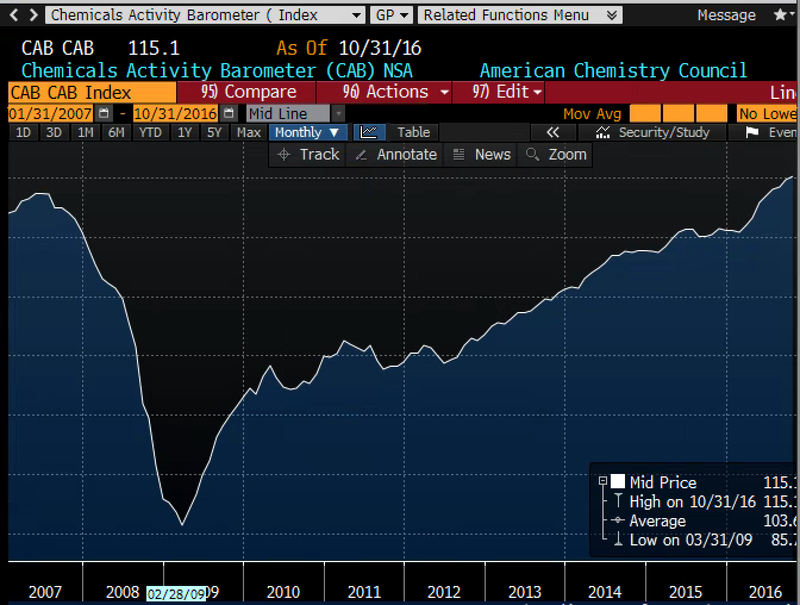 Deflation worries have all but evaporated. 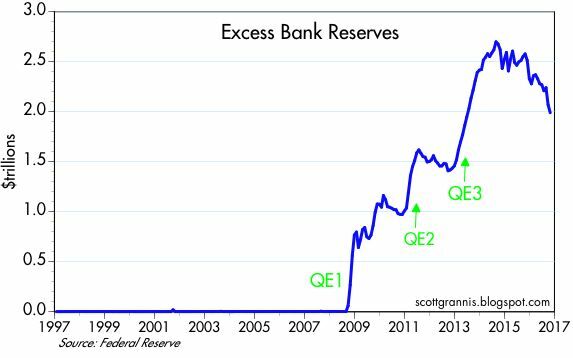 This opens the door wide to a Fed decision to normalize interest rates at higher levels. 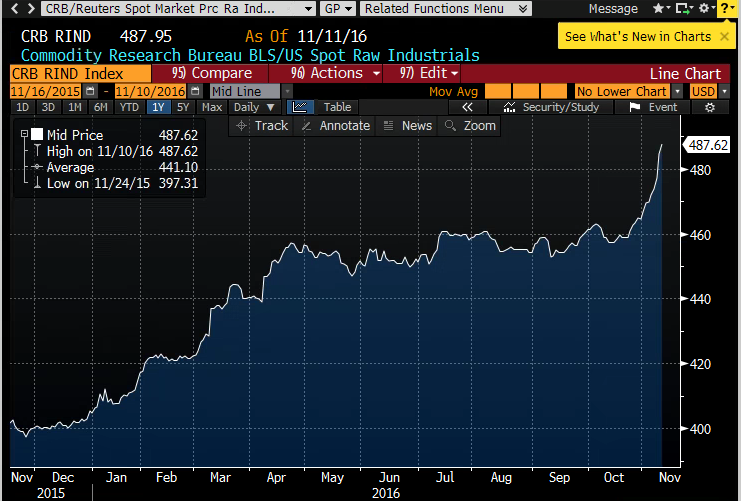 Not surprisingly, the market fully expects the Fed to hike rates at its December meeting. 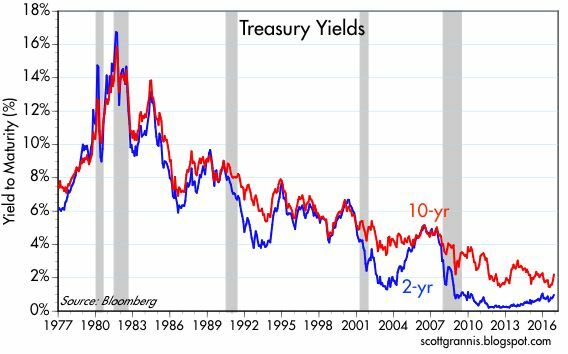 The chart above shows us where real short-term rates have been (the red line) and what they are expected to average over the next five years (blue line). The market only expects the Fed to raise real short-term rates from -1% to zero. 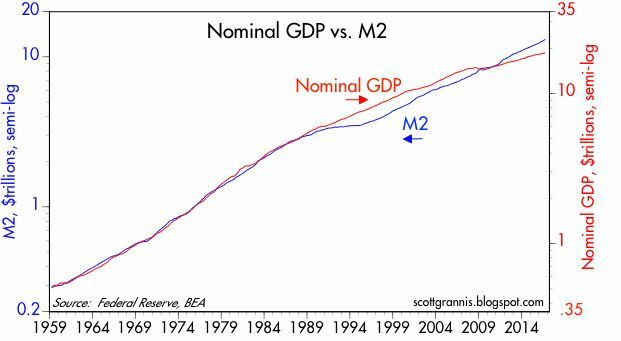 That's a very modest tightening and as such poses no threat to growth. 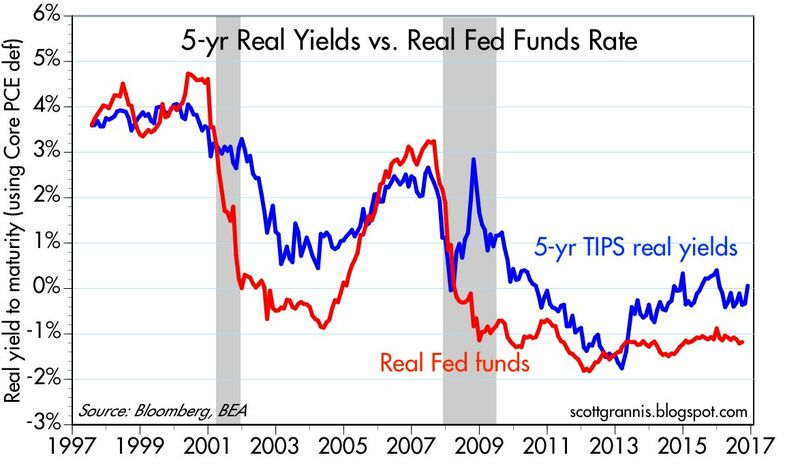 The time to worry is when current real rates exceed expected real rates (i.e., when the real yield curve is inverted, as it was prior to the last two recessions). If Trump manages to hit a growth home run with policies next year, I would expect to see real rates substantially higher than they are today, thanks to much stronger economic growth expectations. The chart above illustrates how real yields on 5-yr TIPS tend to track the real growth trend of the economy. 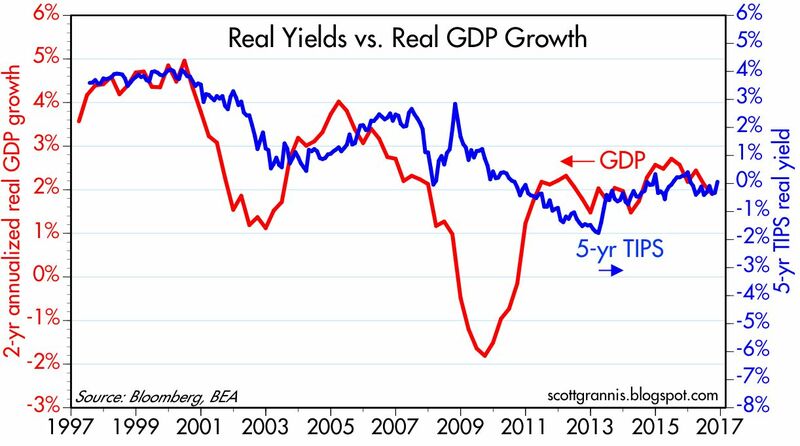 If economic growth picks up to 3% or better thanks to better policies, expect real yields to move substantially higher as well. 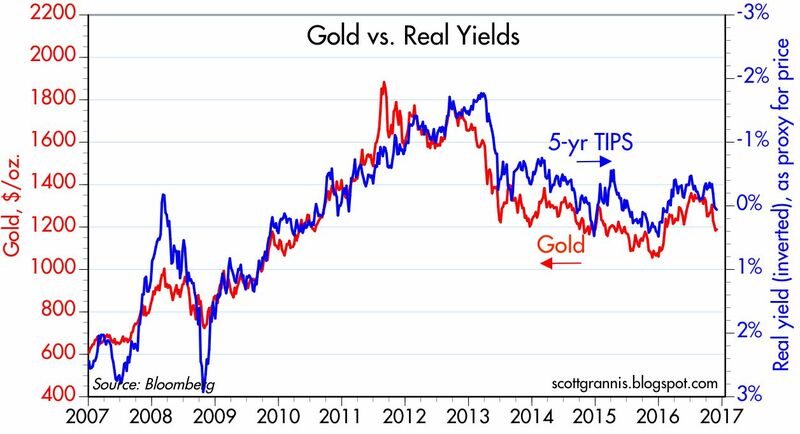 As the chart above shows, gold and TIPS prices have turned down noticeably of late, and this is a very good sign that investors are becoming less risk-averse. 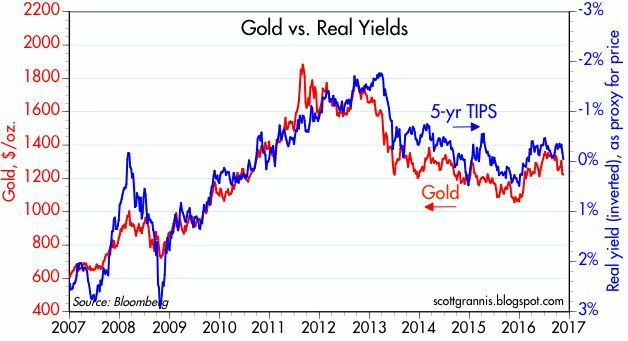 Less risk aversion means less demand for gold, money and safe assets, and a greater propensity to work and invest. All of which is very welcome. 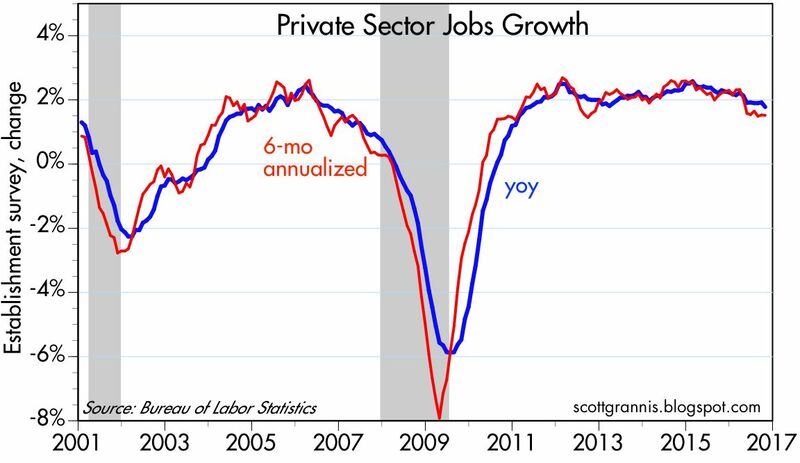 And likely to continue. 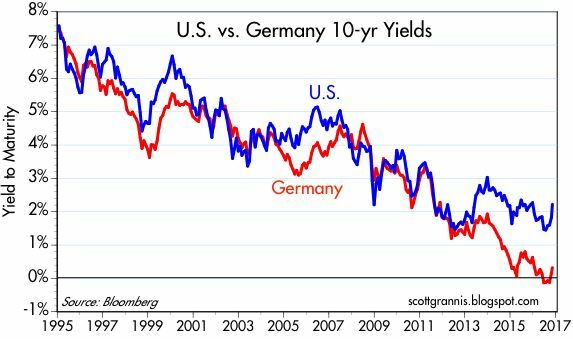 Bond yields in Germany are tracking those of the U.S., although they are still substantially lower. This tells us that while growth expectations are improving on both sides of the Atlantic, the Eurozone economy is still fundamentally weaker than the U.S. economy. Not surprisingly, the dollar has been outperforming the Euro. 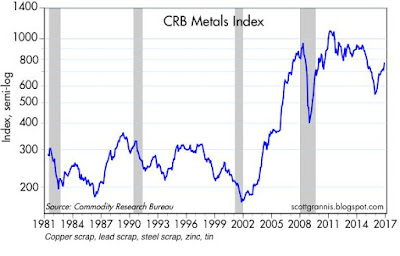 The chart above illustrates the very strong performance of industrial commodity prices in the past year. 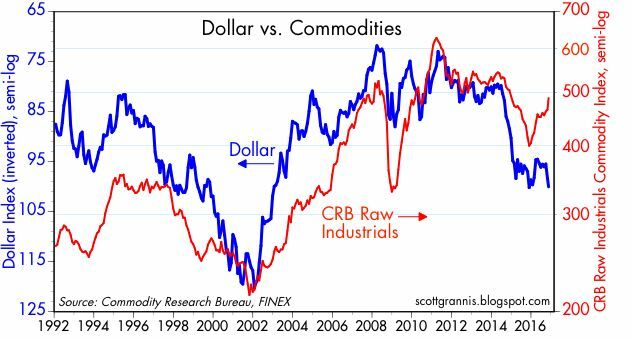 It's notable that commodity prices are up in all currencies, even the dollar. 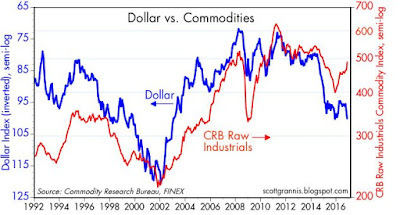 As the chart above shows, commodities typically tend to move inversely to the dollar. 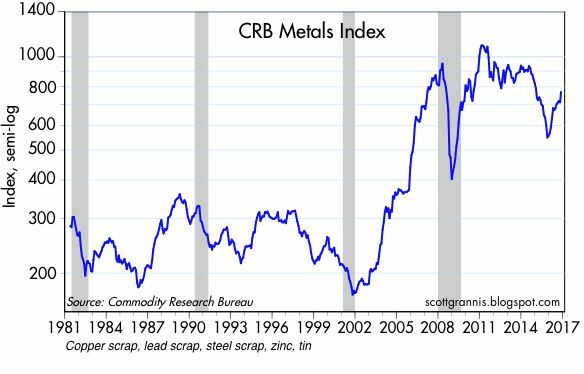 I think this tells us that rising commodity prices are a reflection of stronger global growth fundamentals, not because of a monetary reflation. As the chart above suggests, short-term bond yields have been unusually low relative to core inflation. I think this tells us that the market has been very risk averse, willing to pay a lot for the safety of Treasuries. 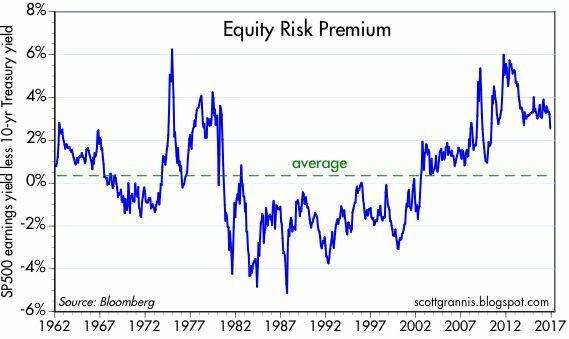 Risk aversion is beginning to decline on the margin, and if this continues we could see yields rise substantially over the next year. 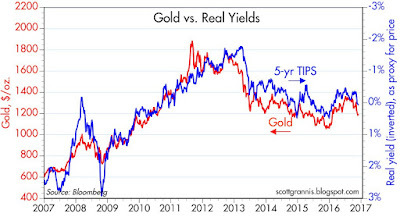 If inflation continues to run at 2% or so, 5-yr Treasury yields ought to be at least 3%. 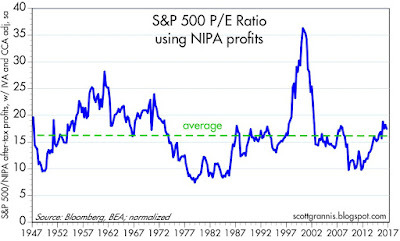 That's almost double their current yield. 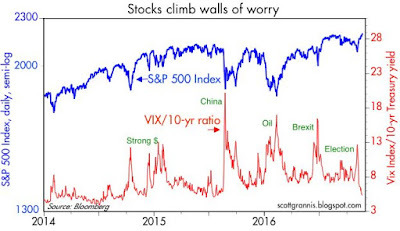 The chart above shows that stocks are up on the margin because uncertainty about the future (the Vix index) has fallen while confidence in future growth (the 10-yr Treasury yield) has risen. 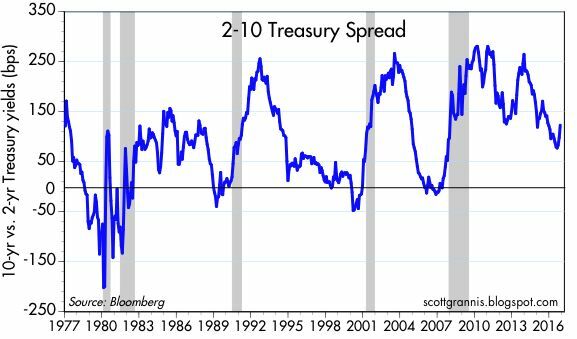 We're still in the early stages of what could be another big bear market for bonds, but we're also still in the early stages of Trump's policymaking process. 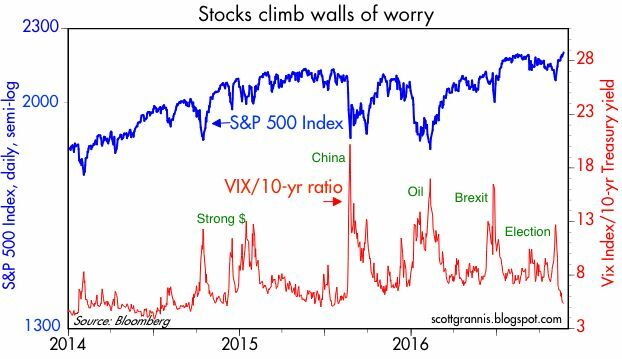 Expect to see disappointments and positive surprises along the way—it could be a bumpy ride for a while. The elections are upon us, and the outcome seems more uncertain now than it did before. Half the electorate believes Clinton is a chronic liar and deeply corrupt; if she wins, she will almost certainly face more scandals, a potential prosecution for felony offenses, and possibly impeachment. The other half is appalled that someone as uncouth and unpredictable as Trump should have access to immense power. Whichever one wins, he or she will face an uphill battle to impose an agenda. I think Trump would be more likely to change policies for the better (with the notable exception of trade), whereas Hillary's agenda would be uniformly negative. 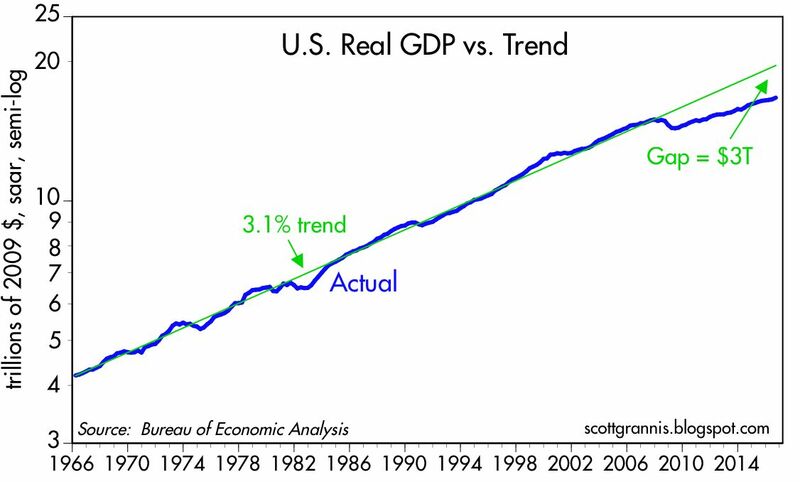 Under Hillary, the economy would very likely continue to limp along; under Trump there is a reasonable chance the economy could strengthen. I'm not a fan of either, but I'll take my chances with Trump. 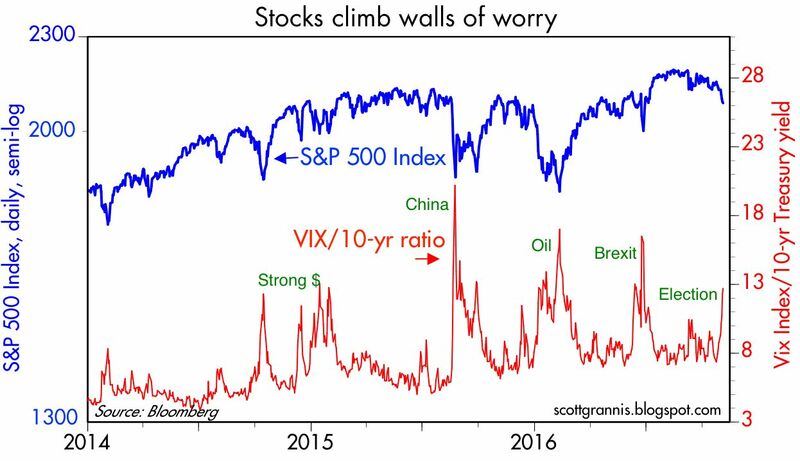 As the election approaches, markets have become more nervous, and stock prices have fallen. Given the great degree of uncertainty that surrounds the election outcome—and the outlook for future policy shifts—it's amazing the market hasn't dropped even further. I take this as a sign that the market has been skeptical all along. 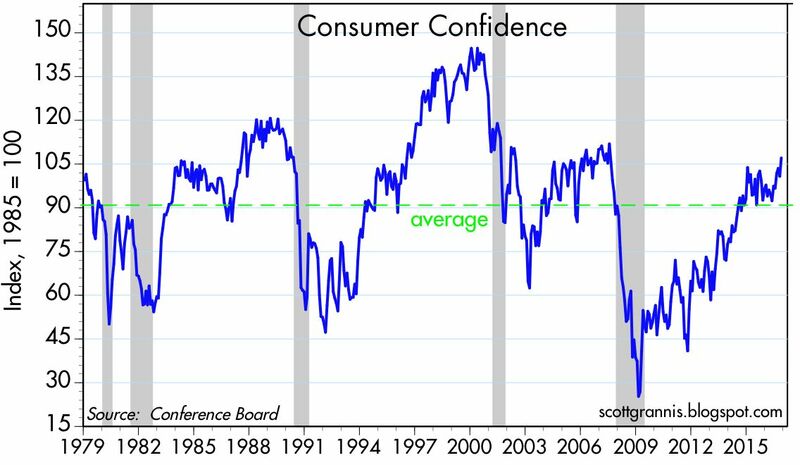 Confidence has been slowly rising from unprecedented lows throughout the current recovery, but it is still far below levels that might be termed enthusiastic. As the chart above shows, the current level of confidence is only slightly above its long-term average. 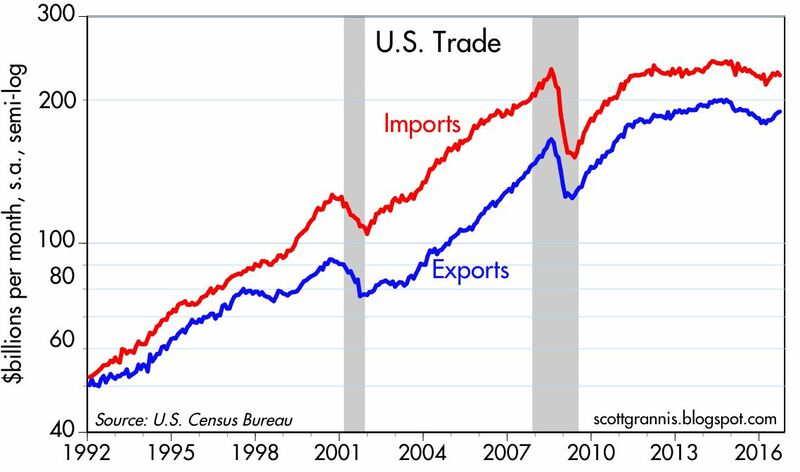 Trade has been one of the economy's most persistent soft spots for years, after experiencing explosive growth in prior decades. The latest September figures show an encouraging increase in both exports and imports. 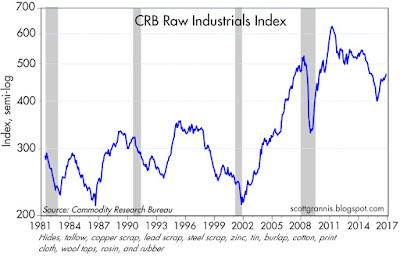 Industrial commodity prices are up almost 20% since late last year, in spite of a modestly stronger dollar (they usually move in opposite directions). 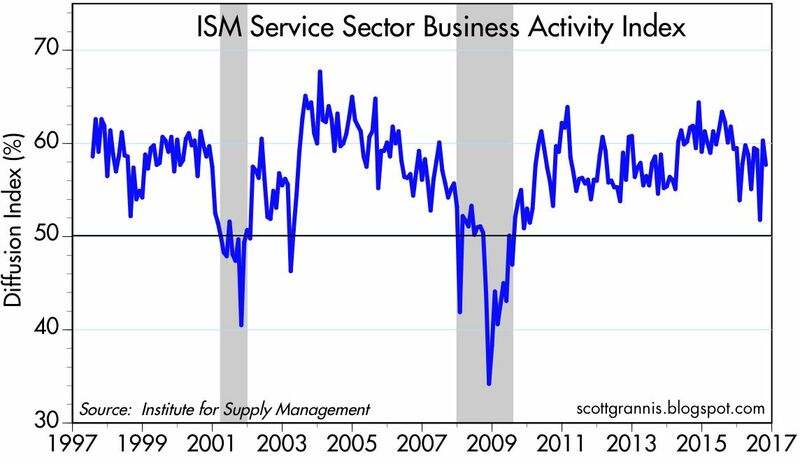 That is a good indication that global economic activity has perked up somewhat. 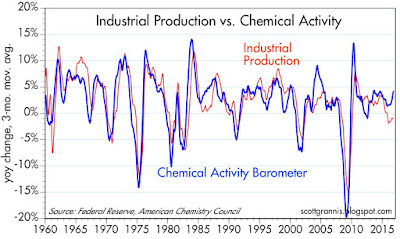 The American Chemistry Council's index of chemical activity is up 4.5% in the past year, and at the very least this rules out any weakening in the economy's fundamentals. 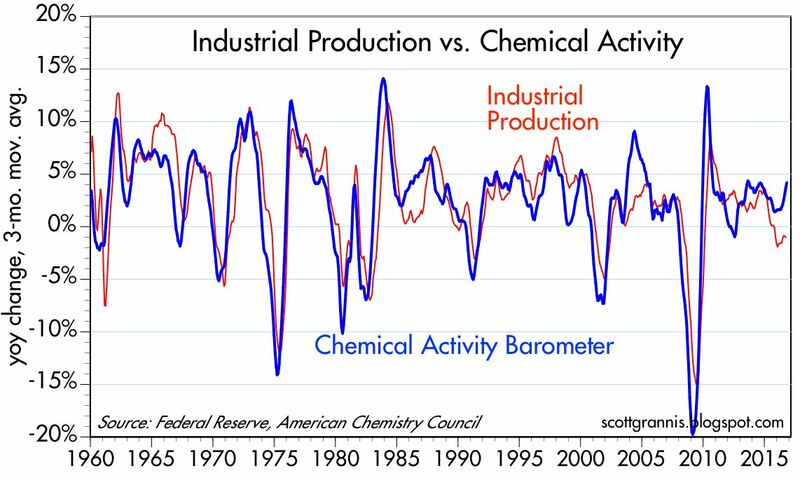 The pickup in chemical activity suggests that industrial production is likely to pick up as well in coming months, as the chart above illustrates. 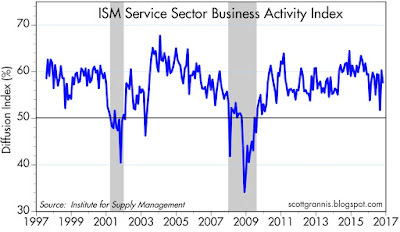 The ISM service sector indices suggest that the economy continues to experience moderate growth. 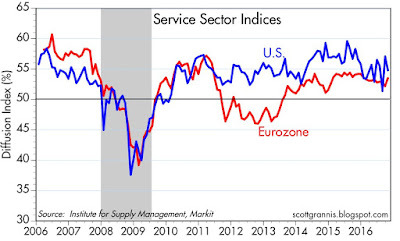 It's encouraging to see a bit of a pickup in the service sector of the Eurozone. 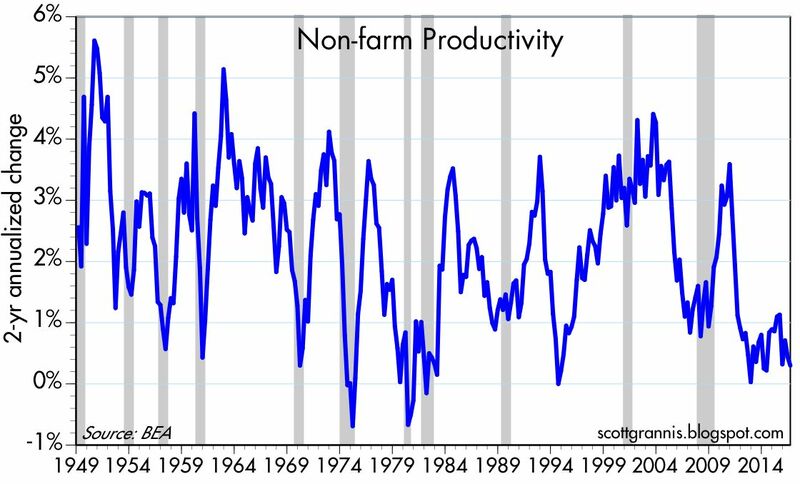 Productivity continues to be weak, and this reflects a dearth of business investment; this has been and continues to be the economy's biggest problem since 2009. 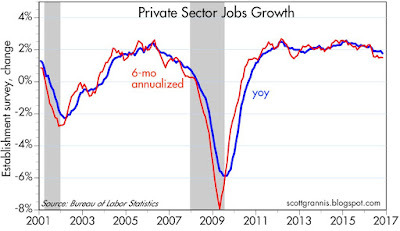 Private sector jobs growth is poking along at just over 1.5% per year. 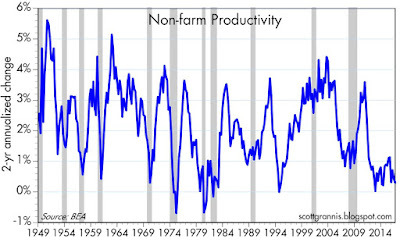 With productivity running around 0.5% this suggests the economy remains on a 2% growth trajectory.